In 2007, a new airship was seen floating over the MLB World Series in Boston. 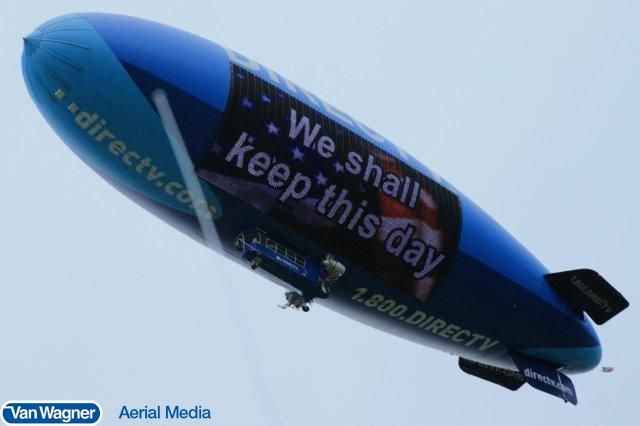 With its massive, never-before-seen LED screen and bright blue creative, the DIRECTV blimp quickly captured the attention of consumers and the media alike. 2. What Kinds Of Events Does The DIRECTV Blimp Fly Over? The DIRECTV blimp took over many of the Goodyear blimp’s appearances, flying the biggest sporting and cultural events across the country. The airship flies a healthy mix of national and regional events, giving DIRECTV access to consumers in most markets. It also participates in on-ground media activations and charitable rides with partners such as the National Breast Cancer Foundation and the Make-A-Wish Foundation. 3. Does The DIRECTV Blimp Have TV Integration? Yes! The ship’s willingness to cover the majority of sports on most networks gives the program flexibility and lends a helping hand to less popular sports/TV networks. Made popular by the MetLife blimp, aerial coverage over major sporting events has become a staple in most major broadcasts. 4. Where Is The Camera On The DIRECTV Blimp? The gyro-stabilized camera is mounted in the gondola, toward the front of the airship. There is so much equipment packed into the ship during TV broadcasts, that there is only enough room for the pilot, the cameraman, and the LED screen operator. The camera provides excellent hi-definition video that is transmitted to the ground via microwave downlink. The transmission is intercepted by a receiving antenna that is hard-wired into the network’s production facilities. 5. 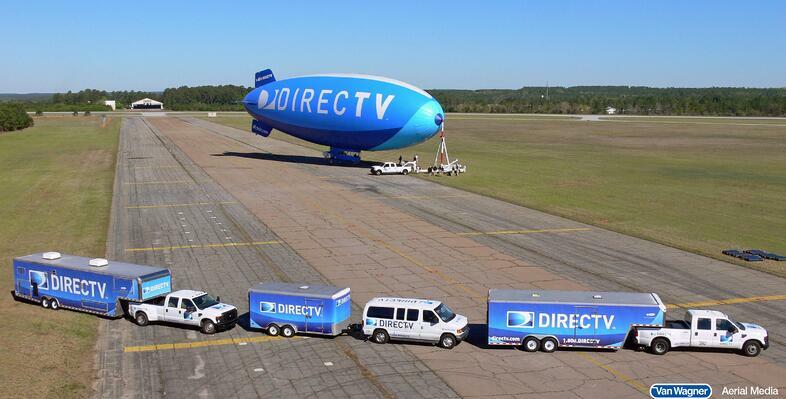 How Big Is The DIRECTV Blimp? The DIRECTV blimp is an A-170LS (lightship). It impressively measures in at 178 ft in length, 46 feet wide, and holds approximately 170,000 cubic feet of helium. The blimp is also the only ship in the world with a 2,100 sq. ft full-color LED screen. 6. What Is A Lightship? The term lightship means that the airship has adopted Van Wagner’s internal illumination technology, allowing the ship to fly both day and night. 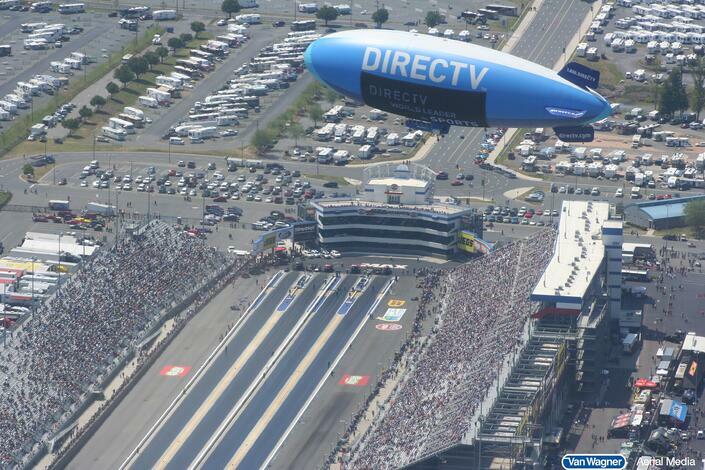 7. Who Owns The DIRECTV Blimp? 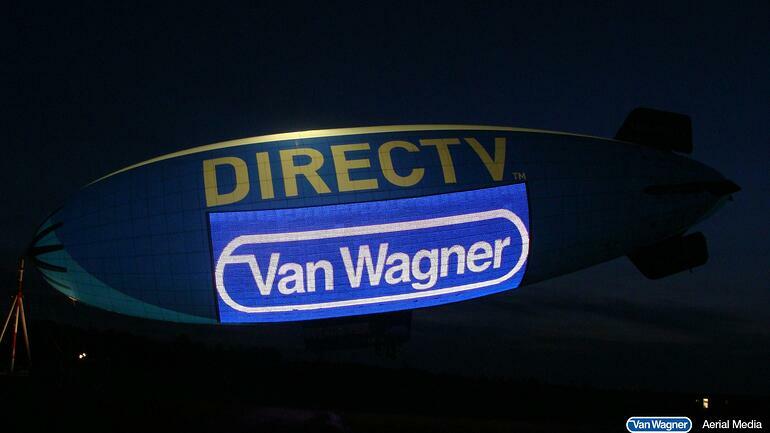 Van Wagner Airship Group LLC owns and operates the DIRECTV blimp, MetLife blimps, Hood Blimp, Hendrick's Gin airship, and the Appliances Online blimp flying in Australia. Our staff runs the day-to-day operations of the ship and travels with it across the country. It takes a team of 13-16 people to operate the ship at all times. 8. Where Is The DIRECTV Blimp Flying Right Now? By following the DIRECTV blimp on Twitter and Instagram (@DTVBlimp) you can find out where the ship is currently flying and interact with the ship in real-time! 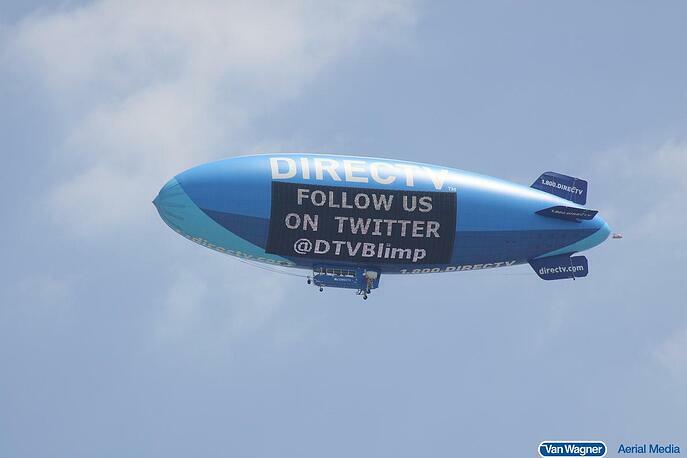 The DIRECTV blimp loves it when its fans say hello on social media.